Have you noticed how quiet and smooth most modern cars feel to something a few years older? Drivers are being increasingly isolated from the road with soft rubber, liquid filled mounts, and sound deadening. This is done to reduce what’s called noise, vibration, and harshness, or NVH, and the downside is often a reduction in handling performance and response. The enthusiast driver who actually wants to feel the road is stuck with a numb, disconnected feeling, sofa on wheels. The nice thing is that there is a fairly easy and inexpensive way to regain some control and performance, in the form of replacement suspension bushings. Bushings are all the little rubber parts in our suspension that absorb vibrations and allow motion. Changing out these tiny, often overlooked bits makes a difference in a number of ways. To achieve the best cornering performance, we need to extract every last bit of grip from the tires, and to do that we need to keep them in good contact with the road. Good contact means that the tread is kept flat and sharp forces are minimized. The strut, spring, suspension geometry, and alignment are responsible for making this happen. The strut/shock/damper is there to control the chassis, unsprung weight, and to keep the tire on the ground. If you’ve ever seen a car driving down the road and it looked like the tire was being bounced like a basketball, it’s because the shock is blown, and is doing nothing to damp the motion of the suspension. You can probably tell this isn’t good for grip, and that having a good damper is very important for both ride and handling. But I’m not here to talk about shocks and damping today, so I’ll move on. Not only does the tire need to stay firmly pressed against the ground, the tread needs to stay flat on the ground. When a car goes around a corner, it leans, the outside suspension compresses, and the tire flexes and rolls over. If you try to do any hard cornering in an average car, most of the work will actually be done by the outside edge of the tire, which is not good for grip. To improve on this, we put on stiffer springs, stiffer swaybars, and change the alignment so the car will roll less and the tires are angled in at the top to begin with. This way the tread ends up flatter on the ground while cornering. However, there is one more component- the soft, stock suspension bushings. Under hard cornering the suspension sees a few thousand pounds worth of loading, so anything not solid- strut tops, tires, and suspension bushings- deflects by a significant amount. This means that perfectly dialed in alignment and corner balancing goes right out the window when it’s needed most. With less compliance in the suspension under load, the car will track through a more direct path, respond better to steering inputs, and be easier to control at the limit. This is especially noticeable on older cars with worn out bushings, but a performance upgrade will still make a real difference on a brand new car. So then, what do you do? Well, if you’re a serious racer, you replace everything with a solid metal spherical bearing. Doing this means the tire transfers every single bit of cornering force right to the damper, spring, and chassis, and there is almost no deflection/compliance in the links and bushings themselves. Just in itself that will improve grip and response by and letting the shock do it’s job of controlling the chassis and unsprung weight, and keeping the tires pointed where we want. Additionally, any resistance provided by a rubber bushing to suspension movement (many will flex in order to allow arms to move) is pretty much eliminated. 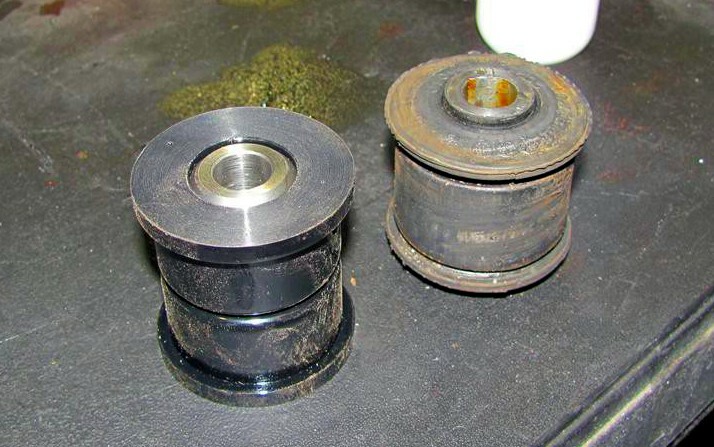 The downside of spherical bearings is noise, harshness, and increased maintenance. A quality bearing with a dust boot tends to hold up pretty well, but many bearings will start to knock and clunk after a pretty short period of time..And good bearings aren’t cheap- the costs can easily run into the thousands dollars, especially when custom bearing carriers and spacers need to be machined. Thankfully, a happy medium between a soft stock bushing and custom fit spherical bearings exists. There are usually a variety of stiffer bushings available, even straight from the manufacturer in some cases. Some are rubber, some are urethane, there are different designs, and they all accomplish basically the same thing. Replacement bushings are much stiffer to reduce deflection and alignment changes, while still being made out of a flexible material to absorb NVH and make the car livable on a daily basis. Harder rubber bushings are usually the best option when available as they are frequently an OEM part with a different compound, and are more tolerant to out of axis rotation. Subaru, for example, has a full line of group n competition parts which includes a stiffer replacement for every bit of rubber on the car. Urethane bushings tend to be easier to install and in some cases can be a harder material. The newest offerings are made from high quality graphite impregnated urethane, which self-lubricates to prolongs bushing life and reduce squeaks and binding. The best part about the replacement bushings is that you can usually find a whole set for a few hundred bucks. The result- a huge improvement in handling at a very reasonable cost. If you happen to drive a Subaru, we know all about suspension upgrades for those cars and have a sister site that carries a good selection of bushings and other parts. You can check it out here. First off, thanks for taking the time to write up this article! There’s tons of information out there on tweaking your engine or getting your “fitment” just right, but there’s such a lack of quality writing on suspension tuning. Please keep this up, I’m learning a ton already! Thanks! I actually have a full set of new bushings I’ll be putting in my car this weekend so there will be a follow up to this article. When I first got my 240SX, I got a kit to replace all of her bushings with nice stiff ones. (Polyurethane I think, but don’t hold me to it.) It made SUCH a difference to how she rode, in a hugely positive way. I found this post is a best and very informative post about bushing and suspension.I would like to read your next post too.Looking forward for your next post.